Travel-Tot: Out and About: Separation Anxiety! According to the Center to Prevent Lost Children, 90% of parents will experience losing a child in a public place, yet fewer than 1 in 10 parents put some form of identification on their child. As any parent can tell you, it takes no more than a few seconds for a child to wander out of eyesight and potentially into danger. Before the age of three many children do not know their full names, their parent’s names, phone numbers, addresses, medical conditions, or allergies. If they were to become separated from their parent, they would have no way to communicate this information in an emergency or to help locate their mother, father or other caregiver. The Kids Travel Card: Child Safety ID Cards help authorities easily and quickly establish positive identification of your child. The KidsTravelCard contains your name and contact telephone numbers, an additional emergency contact with relationship and phone number, your child's specific personal information, as well as any vital personal or medical information you feel might be important to include. The card can even be customized with "trip specific" information! Four removable adhesive labels come with the Photo ID badge where you can write information for a specific event and then remove the label afterwards. Each KidsTravelCard comes with a soft cloth "break-away" lanyard for comfort and safety. For more information click here. Safety Identification Tags by Think in a Blink: Flexible, water-proof, safety identification tags can be fastened to a child's shoes, jacket zipper, bathing suits, belt loop etc. Simply write an emergency number on the back of the tag with permanent marker. Think in a Blink Safety ID tags "empowers" your child with the information they need to be reunited immediately with their caregiver. For more information check out this link. Wearable ID Products by My Precious Kid: This company carries a wide variety of wearable identification products (everything from bracelets and shoe tags to dog tags). They also feature a number of electronic child locator devices. For more information click here. Wearable ID Products and Parking Pal Magnet by Chicks and Cubs: This company carries an extensive line of wearable identification products (everything from bracelets and shoe tags to dog tags). They also feature The Parking Pal Magnet, which works great to aid you in your child's safety in parking lots. Telling a child to keep his or her hand on the magnetic hand can give you the chance to get things out of the car or put things in without them running into the roadway. For more information go to their website. BrickHouse Child Locator by BrickHouse Security: The BrickHouse Child Locator gives parents piece of mind in a way that simply has not been possible before. The instant your loved one wanders too far, the hand-held locator will instantly notify you with loud beeping, vibration and directional guidance all at once. Perfect for younger or special-needs children, helps take the weight of worry off your shoulders by alerting you the second they wander - not a moment too late. As an added precaution, a Panic Tag with new "click" technology is included for your child to press alerting you they feel in danger. Safety Tattoos by Safety Tat: SafetyTat is a fun and colorful kids temporary safety tattoo. When applied to the arm of your child or loved one, SafetyTat provides a highly visible form of identification that stays in place even when wet! Check out their website for more information. 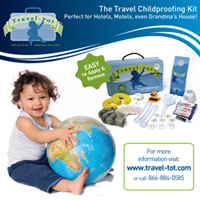 Travel-Tot also loves this tip submitted by a longtime friend and nurse: Put a blank label with emergency contact info on bucket car seats in case you are ever in an accident with your infant. That way a loved one can be called to take care of your child rather than social services in the event that you are incapacitated. All of these products and suggestions give your child a “voice” in the event that you become separated, which can not only help ease anxiety, but which can facilitate a quick and safe return! You need to check out this site: http://www.whaleprogram.org/. St. Clare's ran it a few years ago and all of my kids seats are equipped with emergency contact information. A sticker is provided on the side of the seat that emergency responders know to look for (thus prompting them to look on the BACK of the seat where the info is hidden from plain site) AND I've put emergency contacts in my glove compartment with my insurance info/car registration info (figuring that's where the police would go first when trying to figure out who I was). Hope that helps! What a phenomenal idea and a great site! Thanks so much for sharing Elizabeth! Readers: the site even features a map so you can search for a W.H.A.L.E. program in your area!